Mommy, Where Do Fanboys Come From? The word "fanboy" traces its origins to the comic book culture of the early 1980s. The most familiar image of this sort of fanboy is The Simpsons' Comic Book Guy, an overweight, bearded, socially awkward 30-something, an obsessive collector of both comic books and comic knowledge. Although his limited interactions with the outside world are surly and unpleasant, they are characterized more by disdain and condescension at the ignorance of the general public than by hatred. The comic book fanboy is essentially an archivist, his ire typically aroused not by other fanboys, whom he considers alternately to be peers, audience and pupils to his encyclopedic knowledge, but by careless comic authors who dare to disrupt his knowledge with inconsistencies. The gaming community's perception of the stereotypical fanboy neatly mirrors the public perception of the stereotypical gamer, generally described as a male aged 13-16, whose potent mix of adolescent hormones and insecurity cause him to lash out against slights both real and imagined. Obviously not every identified fanboy conforms to this rather unflattering stereotype, and as with the exaggerated "comic book guy," this teenage straw man is probably inaccurate more often than not. 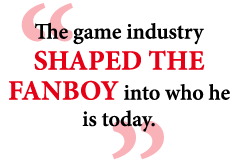 However, if we set aside questions about the accuracy of the imagery and explore why the stereotype exists, we can identify how the unique characteristics of the game industry shaped the fanboy into who he is today. Most of the traits typically attributed to fanboys are merely those same traits traditionally ascribed to teenagers. Adolescence is a painful time for many, dominated by awkwardness and a desperate need for acceptance. A fanboy community has the potential to provide this sense of belonging. Like many passionate communities, fanboys frame themselves around an easily identifiable enemy: the adherents to the competitor's product. There is perhaps no greater tool to promote unity that the identification of a "them" to set against "us," an enemy to band together against. Since videogaming is a business, we look to the market to provide such a structure, and modern economic theory obliges. Oligopoly markets are primarily characterized by a very high cost to enter the market, a fact well appreciated by Microsoft; aside from R&D costs affiliated with developing a console, they spent the first Xbox's entire lifespan establishing themselves as a player in the industry. Oligopolies are also characterized by either identical or differentiated products that are near perfect substitutes for one another. Technologically speaking, the experience each major console delivers isn't strikingly different, and boils down to a matter of preference. What's more, publishers' inclination toward multi-platform releases makes your choice of console even less significant. Despite interchangeable products, oligopoly markets also often observe high degrees of customer loyalty due to differentiation brought by considerations aside from price or quality. There was a time in America when a man defined himself by the brand of car he purchased, and a Ford man wouldn't dream of purchasing anything but a Ford. Chances are, even now you prefer Coke to Pepsi, or vice versa. Wherever these loyalties come from, whether it be perceptions of quality, associations with childhood or something else entirely, we can rest assured that some of the exact same mechanisms are at work in the fanboy's mind, commanding loyalty to whichever brand has captured his allegiance.